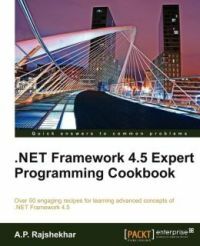 The latest Packt publishing book I received a free review copy for was .NET Framework 4.5 Expert Programming Cookbook by A.P. Rajshekhar. As soon as I glanced over the table of contents it stood out to me that this book doesn't really have a prevailing theme even though it's pretty thin. It's a collection of mostly unrelated recipes, i.e. short snippets of code focusing on a single problem accompanied by detailed explanation. In spite of the title, not of all of them are really .NET 4.5 specific, many of the features used have been available in previous versions as well. The book does mention that for each individual recipe. Most of the sample code also includes much plumbing (mostly UI setup) which doesn't really have anything to do with the problem at hand. I found that pretty distracting during reading. I think it would be a better idea to include full sample programs as download only and focus more on the actual recipe in the book. This might not be completely in line with the cookbook approach but I doubt anyone is going to type the code from the book, anyway. I've never really been a fan of recipe based books although I did like some of them if they provided enough value in the explanations to warrant reading the book as whole. This one does seem more like a collection of blog posts, although admittedly it has passed a much stricter review process. Still a couple of recipes are objectionable, such as the ones still manually handling threads in the age of .NET 4.5. Most of the recipes are well written, though. If enough of them are of interest to the reader they should provide enough value to be worth the purchase. Fortunately the complete table of contents is available online and I definitely suggest everyone to check it out before deciding whether to buy the book or not.